Clients, be sure to scan these to see suggestions from other clients and to get even more out of your subscription with us! Problem: Kids are in one family / parents in another. Husband is in one family / wife in another. Problem: Groups scheduling time off. Stop sending meeting report reminders. Solution: Select next meeting date. Upgrade: Now works not only for every week and every other week, but all other meeting frequencies as well. 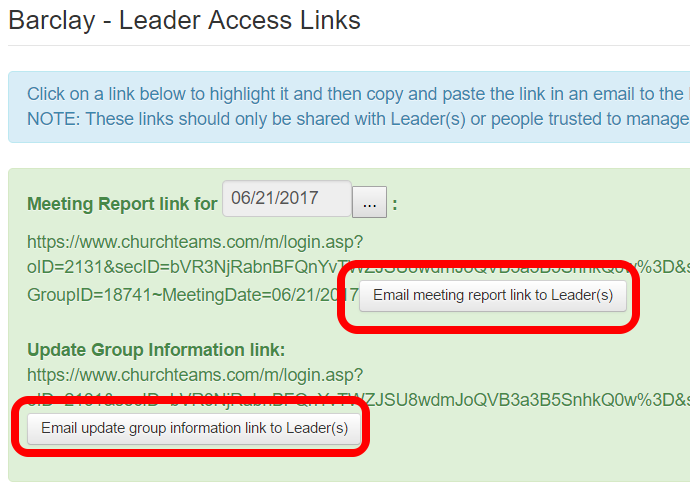 Problem: Need to resend a meeting report reminder link or a link for a leader to update their group information. Upgrade: Added button to send email from here rather than copy/paste. Problem: Customize the columns on the group info page. Upgrade: When you customize a view, you can now see a list of the groups with that view as the default. Problem: Need to write an email or series of emails to be sent based on some schedule. Solution: Scheduled emails option when you send an email through Churchteams. Shows up underneath email text box. Problem: Want to upgrade and standardize the look of email communication. 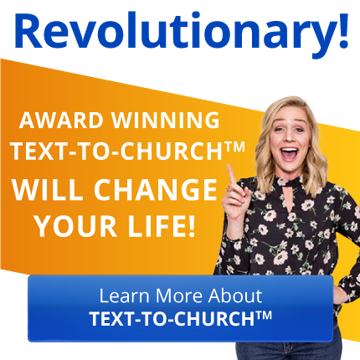 Solution: Addition of templates when emailing through Churchteams. Upgrade 1: Provide you six new sample templates to customize and save. Upgrade 2: Click HTML Only button to remove the editor and use text box for pasting/customizing HTML. Use Preview/Text button to check your work. Solution: Secure Check-in. Parent tag matches child tag. Upgrade: Parent tag now can be customized (Check-in view settings item B2.3) to also serve as a name tag for parents. Problem: Scheduling and managing volunteers. Solution: Volunteer scheduling feature. 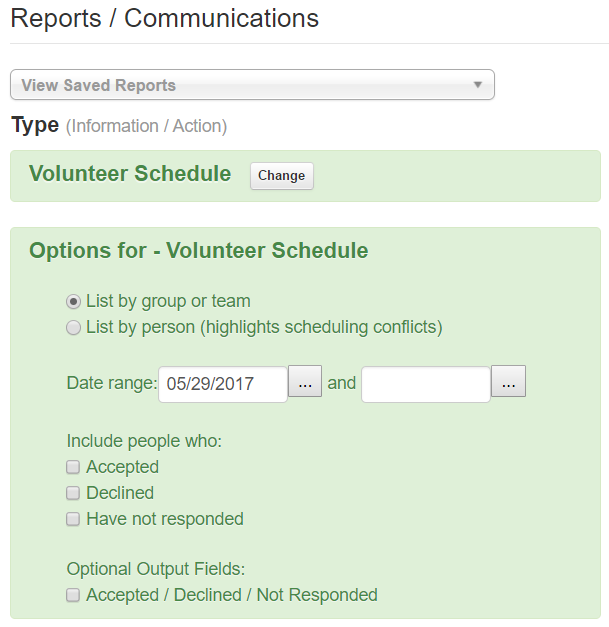 Create team as a group, click Edit then Volunteer Schedule. Upgrade: Added an option to re-send an invitation to everyone who hasn't responded rather than one at a time. Problem: Ability to export data for use in other applications. Solution: Reports > Members > Export to CSV/Excel file. 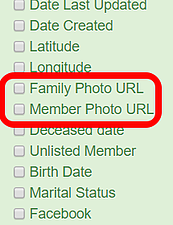 Upgrade: Added individual and family photo URL export options so that pictures can be accessed for other uses. 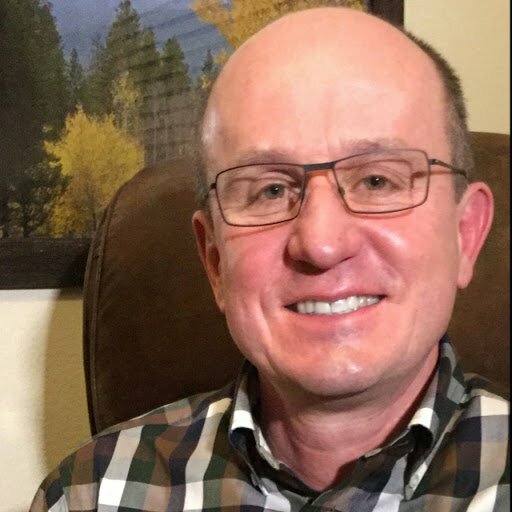 Problem: Donors having access to their giving online. Solution: Online giving created this by default. Upgrade: Create online access for donors who haven't given online. Member Profile > More Info > Contributions > Online Account. Click the Online Account button to create this access for the donor. 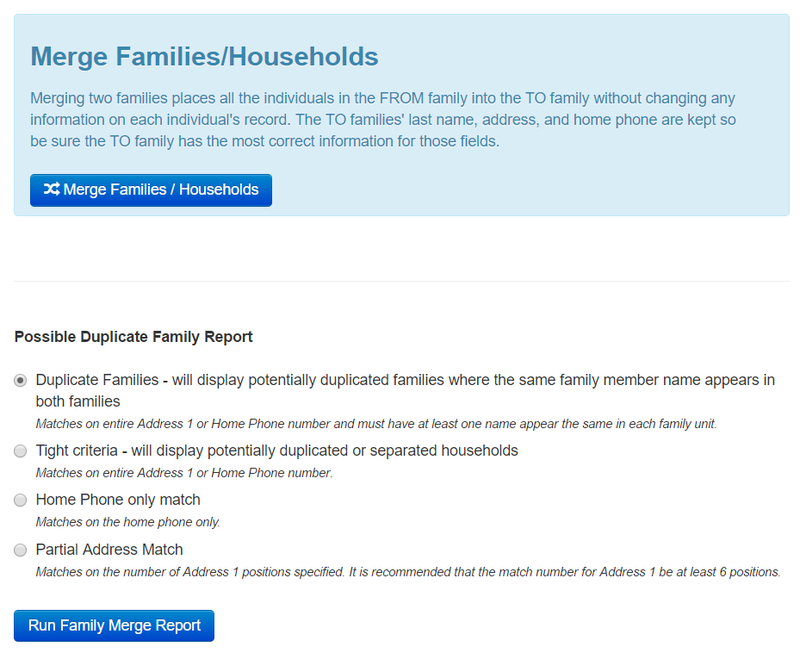 Problem: Registering parents and children for events where you need childcare or parent information. Solution: Registration Setting > Registration Completion Options > Childcare/Secondary registration. Links related groups together like Marriage Seminar & Childcare. 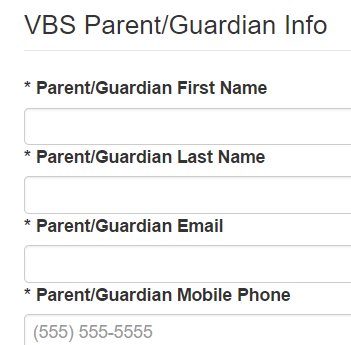 Or VBS Parent Info & VBS Child Registration. Upgrade: The Default Family Role can be set to identify whether that form is intended for the parent/guardian or for children / students. Problem: Presenting events on your website. Solution: Communicate > Linkbuilder. 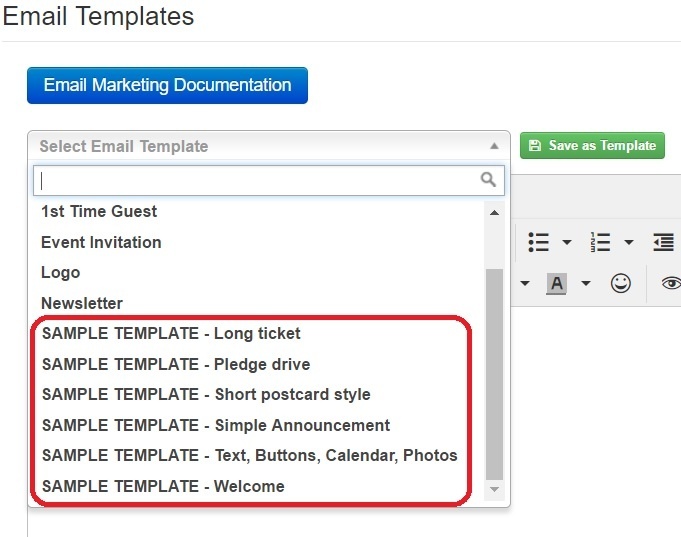 Customize by events and software creates the link or code you need. 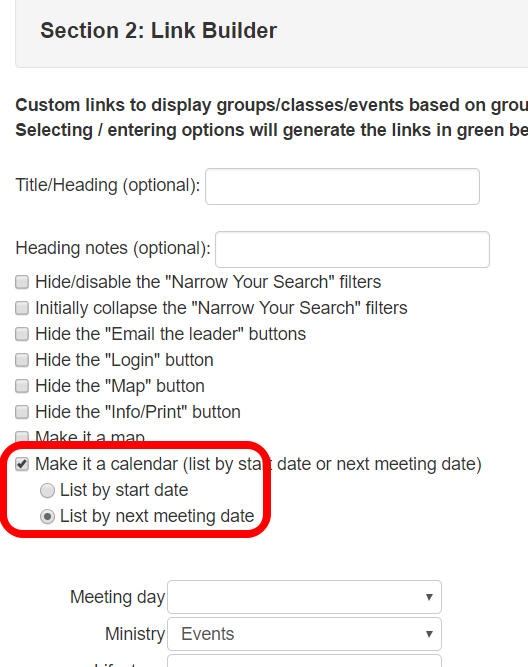 Upgrade: Set actual event date as next meeting date, then create link/code to sort based on that date. All of these came as suggestions based on real needs our clients have had. This is why support is so critical to what we do. It gives us the ability to constantly improve. And, it's how we would want people to treat us. Living out Matthew 7:12.